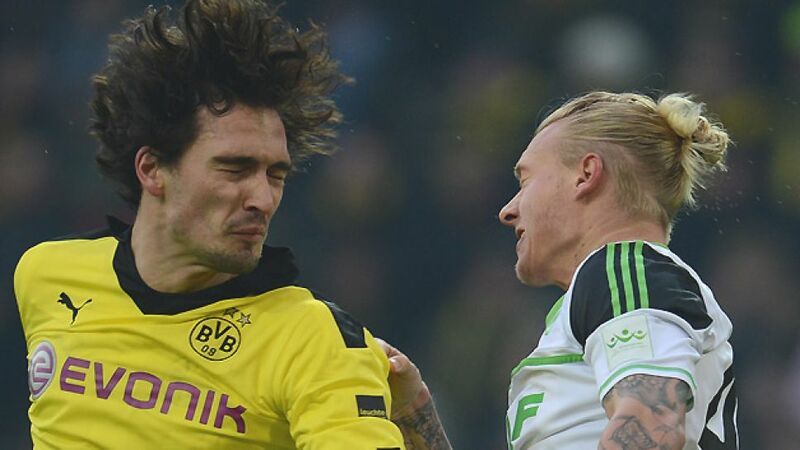 Wolfsburg - Deposed Bundesliga champions Borussia Dortmund travel to VfL Wolfsburg's Volkswagen Arena on Saturday needing just a point to tie up second place (kick-off 15:30 CET). It's not quite the finale Jürgen Klopp might have hoped for, but the Dortmund coach is nevertheless keen to end the domestic campaign with a flourish ahead of the club's final curtain call at Wembley on May 25. "Reaching 70 points is our last remaining goal of the Bundesliga season," said Klopp, before going on to address the ifs, buts and maybes of an otherwise satisfactory campaign. "[The home defeat to Wolfsburg] was a brutal game. We were blown away that day. It's a defeat that's still in the back of the players' minds. So that's why we have a score to settle." Said Matchday 16 humbling is but one of five Yellow-Black defeats this season, a quintet of blanks that account for three quarters of the 20-point gap currently standing between second-place Dortmund and 2012/13 Bundesliga champions FC Bayern, with Klopp's men still ten shy of the 75-point mark that wrapped up a seventh Bundesliga crown just two years ago. Curiously enough, Dortmund also tasted defeat on five occasions back in 2010/11, among them though not a single domestic double. If only that were true this time around, with Saturday's hosts Wolfsburg now one win away from joining FC Schalke 04 and Hamburger SV as one of the brave souls to have twice got one over the Yellow-Black giant this season. "I don’t know what Jürgen Klopp is planning. We need to focus on the job we have to do and not focus too much on Dortmund," said Wolves custodian Diego Benaglio. "They are deservedly in the Champions League final, so we know too well just what kind of opponent we will be facing on Saturday. It's the final home game before the summer break. We want to have as positive a finish as possible and enjoy a final celebration in the Arena with the fans." Wolfsburg followers are certainly in good spirits, even though UEFA Europa League qualification is no longer on the cards. An eight-match unbeaten run has given the VW faithful reason to be optimistic ahead of coach Dieter Hecking's first full season in charge, the former 1. FC Nuremberg tactician having helped his side to 22 points since joining the club last December. "We're really looking forward to the game," beamed Hecking. "[Dortmund's] quite a challenge. The stadium is sold-out and the atmosphere will be great. We want to play our part in bidding a successful farewell to the home fans and hopefully take all three points. I will be selecting what is in my opinion the best eleven. So will BVB."